So much yarn, so little time. 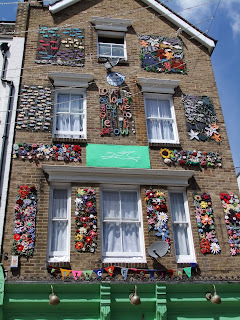 : Folkestone Triennial - is it ART? So we're back to an old favourite - what is "Art"? I rambled about Banksy way back in May so you'll know I'm not exactly qualified as an expert - I'm not even sure what I like, and even less sure about what I think is "Art"! However, I'm always up for a day at the sea, so we headed off to Folkestone to check out their Triennial which runs till September 25th. We wandered around looking at installations (with a brief break for a picnic by the sea, of course) and didn't manage to see everything in almost 5 hours - so be prepared! There is a map showing the permanent exhibits and those that are new for this year, but the first piece I spotted was neither, and had no "label" telling me who it was by. 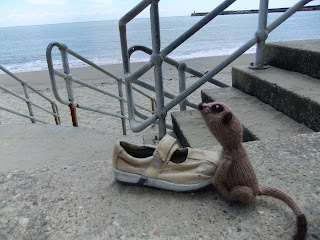 I liked it though - especially as it had a conveniently meerkat-sized nostril! We straight away hit my "problem" with Art. 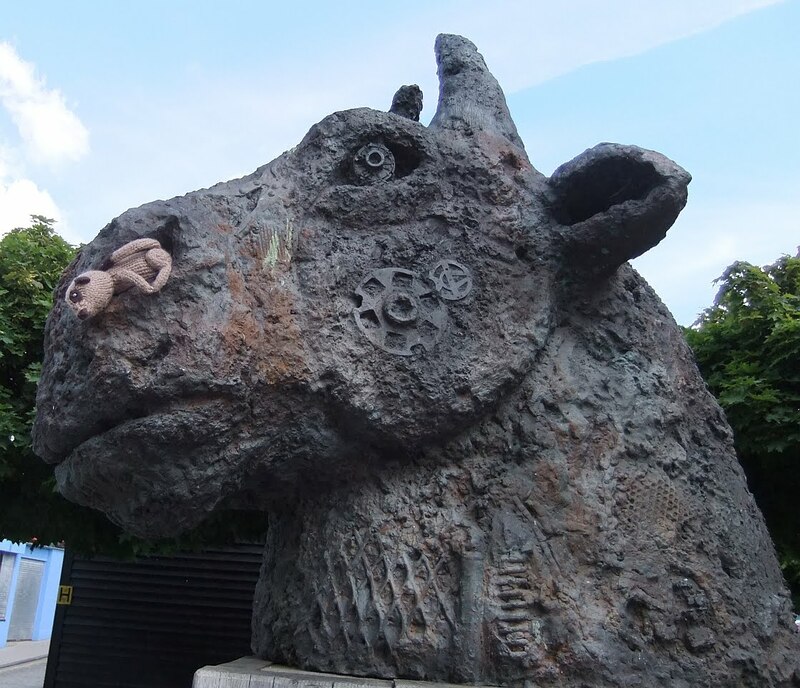 I like this - Folkestone is surrounded by farmland and of course the harbour, so an animal with steampunk-like components seemed very apt to me. But I don't know what the artist intended. I believe Art is a collaboration, a communication between Artist and Audience. I'm not even quite sure what I mean by that though! I suppose i mean there needs to be a message of some sort - but is what I *think* I've understood by the piece the same message that the Artist was intending? And does it matter anyway? The next piece didn't seem to be on the map either, but as a knitter I loved it and I'm not sure it needs to say anything more than knitting is fun! 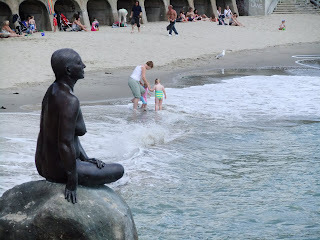 We knew we had to see the Folkestone Mermaid by Cornelia Parker, but I was disappointed to only see her from the back. Maybe the front aspect can be seen when the tide is out. It's beautiful I think - though I've read quite a few negative comments mostly based around "how can it be a mermaid, where's her tail?" and I know that's the first thing many children would ask. When I read how it was made, I had more questions still. "Painting quick setting latex on to her body and then plastering over the top, Cornelia cast Georgina’s back first, then did her front, legs and arms and finally her head. All the while Georgina had to sit motionless, striking the same pose on a granite rock." I was really pleased to hear Cornelia say: "I like that about Art, that it's very hard to understand what it's for." I don't feel quite so inadequate now! The next piece threw me completely. I had read that there were several Tracey Emin pieces, but only realised I was looking at one when I saw someone else taking a photo. and others. But why? 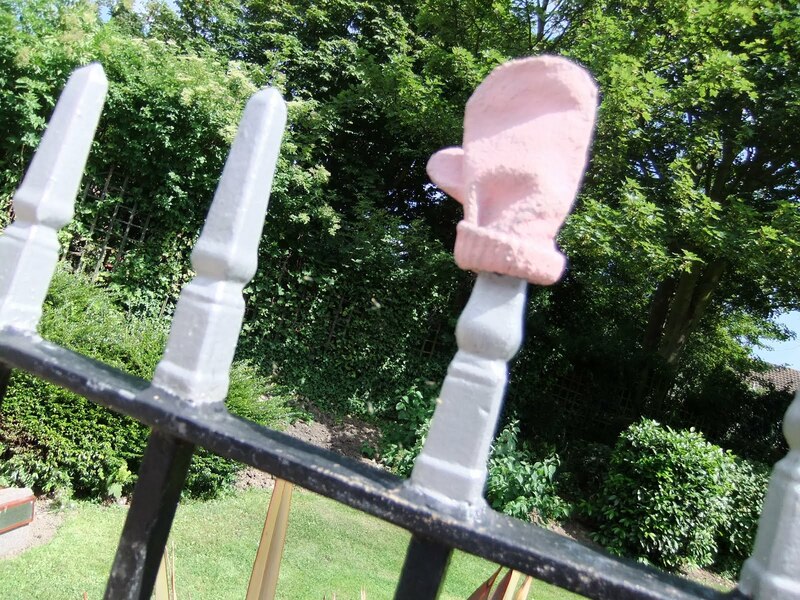 To me, the knitted pieces in particular looked as if they were actual garments dipped in plaster of paris - though actually they're bronzes. They're quite fun because they fooled me at first, I thought they were real. 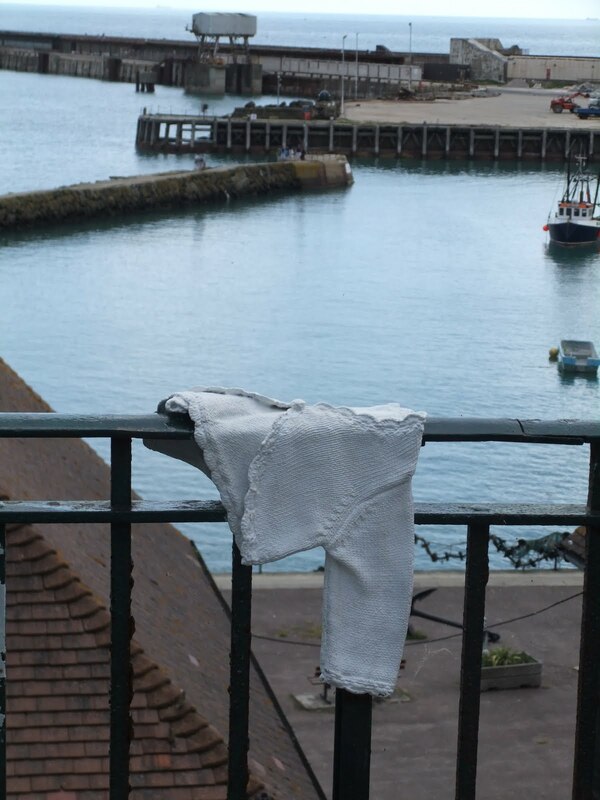 I've often seen lost baby clothes that a kind passerby has picked up and displayed prominently in the hope that they're found - but is it Art? This is the description from the website: "Tracey Emin’s art is one of disclosure, using events from her personal life as inspiration for her work. 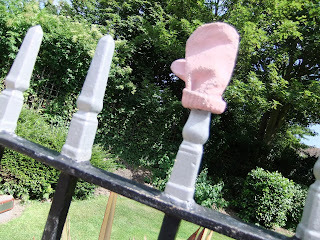 ‘Baby Things’, Emin’s perfect bronze simulacra of baby clothes can be found tucked underneath benches, hanging from railings and lying by a kerb. 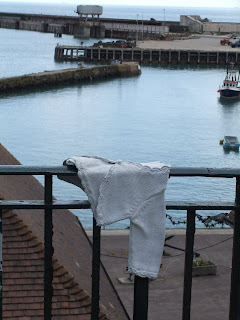 Exuding an aura of the forlorn and dejected, they are poignant reminders of Folkestone’s high teenage pregnancy rate, which is similar to that of Margate, Emin’s home town." Sorry - can't see it. I would never have understood that without reading about it. There are so many many more pieces - but we rather liked this one because we could *do* something. It's also the only piece that resulted in a conversation with other people. 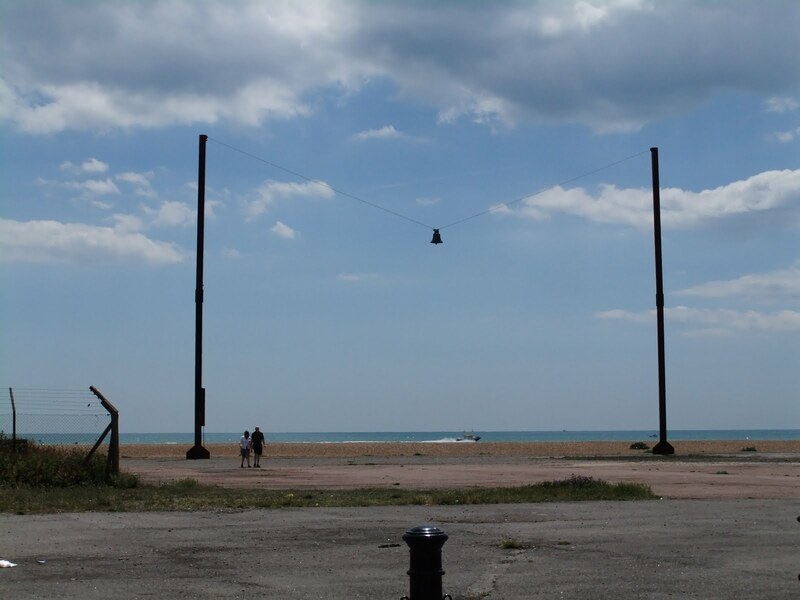 From the website: "Dolven’s installation features a 16th-century tenor bell from Scraptoft Church in Leicestershire, which had been removed for not being in tune with the others. It will be suspended from a steel cable strung between two 20m high steel beams, placed 30m apart. The bell can be rung by visitors using a traditional rope bell-pull." The poor lady who'd got there before us thought she'd broken it - she hadn't seen the sign that said you have to wait two minutes between pulls! The website also explains "Since the 1990s Norwegian artist A K Dolven has worked with the idea of being at odds with one’s surroundings" so maybe that's why I liked this - I'm at odds with Art! 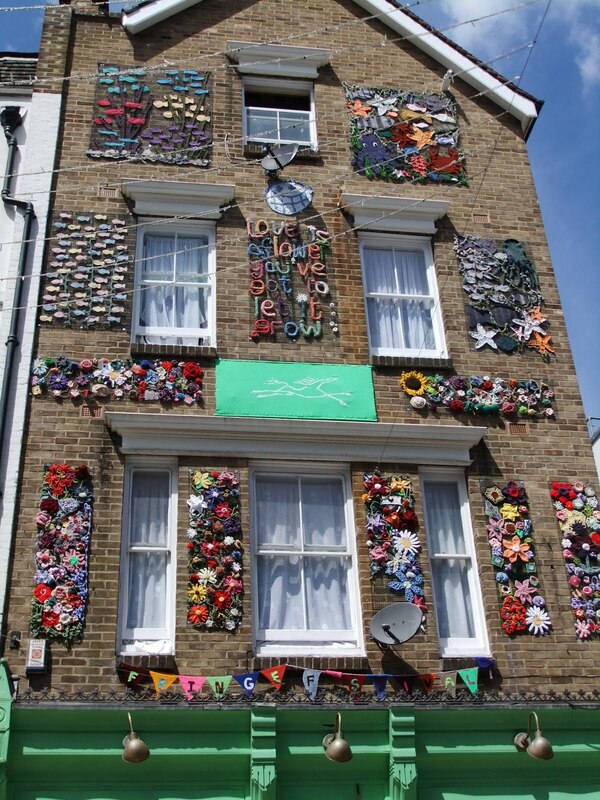 PoetessWug - I agree, I don't think the knitted panels are "art" - but I'd rather look at them than a dead cow in a box or some other acclaimed "Art"! After many years of pondering on this, I now feel it is everything around us - that has been created - and in the same vein, we either like it or not. Only thing I can't stand is pretentiousness about what artists deem "art"
colleague used to refer to nature as art, because she believed nature to be created by God. I didn't share her belief, and although nature is utterly beautiful I don't believe it is a communication, I don't think it has an aesthetic purpose - so to me it's not art.